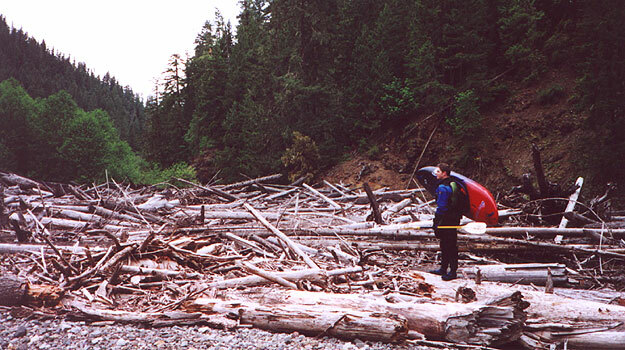 Copyright © 2000 , Oregon Kayaking. No part of this page may be reproduced, linked, or copied without the express written permission of the Oregon Kayaking Webmaster. Pete, Tim and I finally got around to running the Upper Collowash this spring. It was a clear sunny day and we got an early start because the guidebook says that you should treat each descent like a 'mini expedition'. The road winds far away and high above the river on the way to the put in, making this one of the most remote sections in the Clackamas drainage. 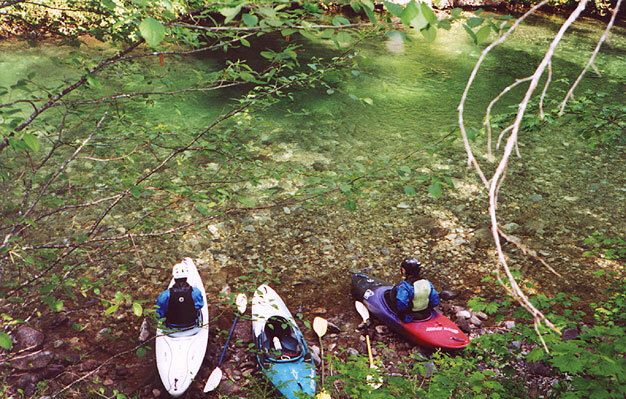 We arrived at the put in and were greeted by fresh, clear water and thick, aromatic forests. We paddled the four mile class two warm up section quickly, but we were a little unhappy with the five log portages. None of them were dangerous, but we started to worry about wood in the much steeper canyon section below. Soon we arrived at the enormous logjam the guide had mentioned, and we set about portaging through the trees on the left. The portage took about five minutes and wasn't too bad. Both Tim and I fell down through the logjam at one point and plunged knee deep into the stagnant water below, much to our displeasure (and Pete's amusement). Tim ponders the 'logjam from hell'. Soon we were back on the river, and the next half mile was eerie. The river swirled slowly around large, dead old growth trees that stood in the river like ancient sentinels, their sides stripped of bark and bleached white by the sun. The banks soon became grassy and we could see otter dens- I joked that maybe we had put in on the wrong river! As soon as I spoke the river turned gradually to the right, narrowed dramatically, and dropped out of sight between dark rock walls. We got out on the right to scout the first drop, a narrow, twisty chute that we ran without problems. 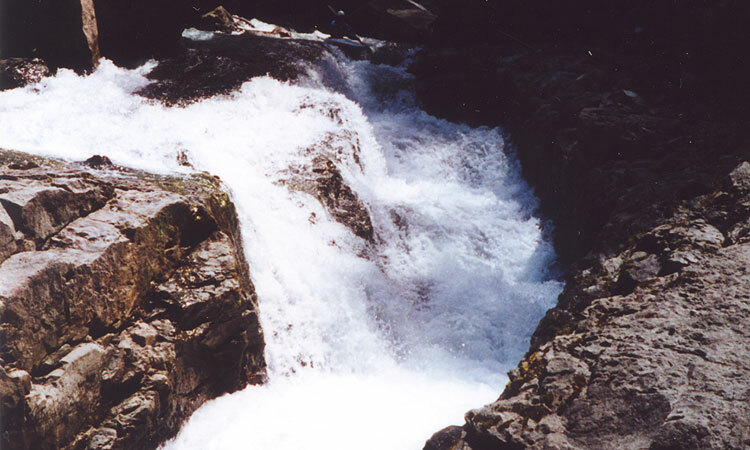 Below this drop the river coiled itself into a large pool and then tore down through a long, complex class V+ drop. 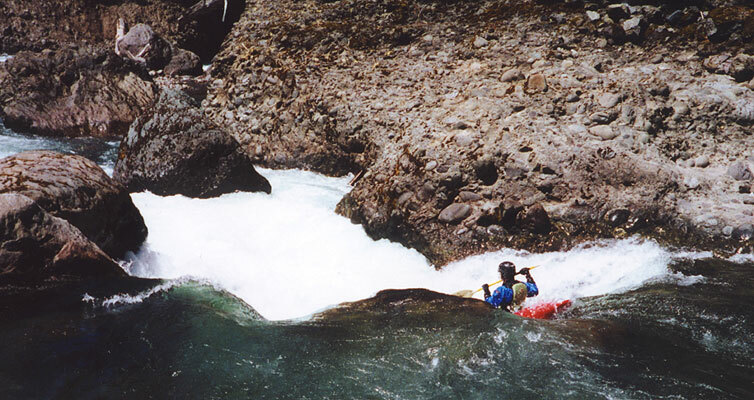 Tim and I portaged this rapid on the right through a jumble of unstable, wickedly jagged boulders that shredded our shoes, boats, and skin. It is worth mentioning that the whole right side of the river has been greatly impacted by landslides on this part of the run. 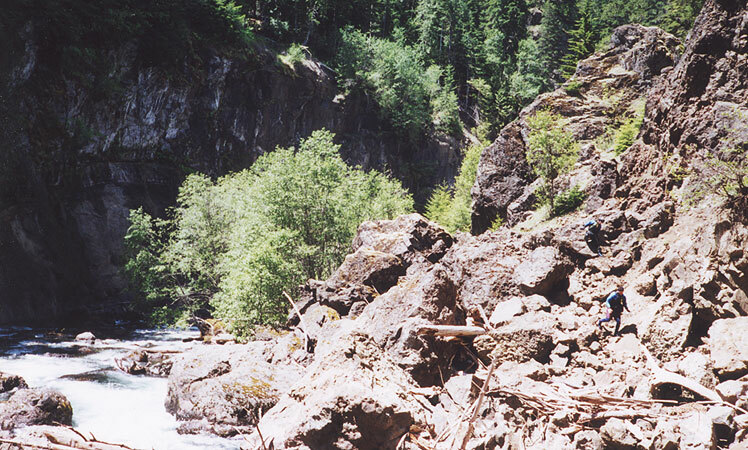 Because of the slides the right bank consists of an enormous pile of unstable conglomerate boulders that are difficult to scramble through safely under the best conditions. The river left bank is a vertical cliff wall, so you have no choice but to suffer through the boulders if you scout or portage. Pete scouted the on the left and considered running the rapid, but in the end he decided not to because there was a log at the bottom and he didn't know what was downstream. Pete scouts the exit move on the V+ drop. We regrouped downstream and scouted The Churn, a large ledge drop with a tricky lead in. Again we scouted on the river right side, scrambling through the seemingly endless boulder fields. Tim and Pete (lower right hand corner) return to their boats after scouting The Churn. Scouting here is a bit arduous, but we were being cautious because we didn't know what to expect downstream. We ran the boulder garden above The Churn and halfway down was a powerful ledge hole. I boofed hard on the far left and beached myself on a rock just downstream to watch Pete and Tim. Pete almost got devoured- he dropped into the hole with no speed, disappeared, and popped up in the recycle. He slowly clawed his way out, and once he was free we signaled Tim to paddle hard and he fared slightly better. Next up was the Churn, which consists of a double ledge drop. The first part of this rapid is tricky- all of the water drops over the top ledge onto a boulder, so the best line is on the left side. That said, you can't go too far left because thirty feet downsteam the river rushes under a riverwide log and the only eddy to avoid the log is just above it on the right! We determined that it would be possible to swim under the log if one of us got blown into it, but that option wasn't desirable because a swimmer would end up in the pool directly above the main part of the Churn, which is an unfriendly drop to say the least. This one required more concentration than usual. The author runs the first part of The Churn. The riverwide log is thirty feet downstream from here. The must make eddy above the log is just behind the boulder from which this picture was taken. We portaged the log from the eddy and got out to scout the even bigger horizon line just downstream, which is the main drop on the Churn. 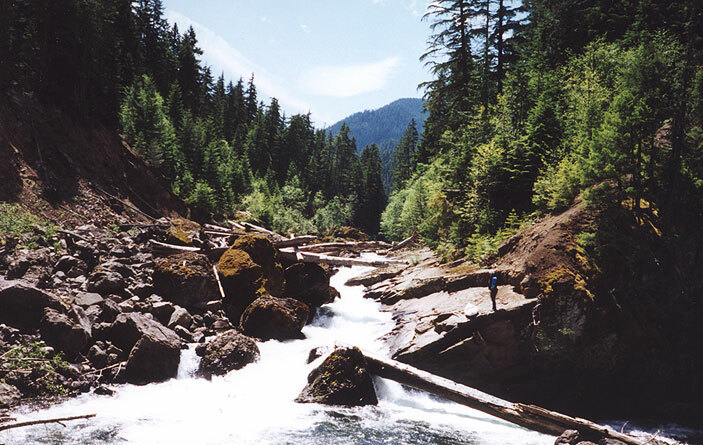 Here the river divides around a bedrock protrusion and most of the flow goes right over a sweet bouldery ledge that is blocked by an enormous old growth log. We were getting a little discouraged at this point because from our vantage it looked like the left side dropped into an unfriendly crack on the far side of the river. We scouted anyway and were pleased to find a runnable chute that dropped over four or five small ledges into a large hole at the bottom. This was one of the best rapids on the river! Pete Giordano gets ready to drop into the bottom half of The Churn. Downstream were some more small drops and then we rounded the corner and were confronted by a second huge logjam! This one was much more difficult (and just plain scary) to portage because the river was tearing along under it... One false step and you're fish habitat! We sweated profusely until we got on top of the jam and then we worked our way over to the left side of the jam and back down to the river. At this point morale was getting a little low from so much unexpected portaging! We ran a couple of nice drops downstream and then arrived at The Cave. Tim runs the drop above The Cave. This hole is backed up by the boulders and there is an undercut on the right. The Cave must always be marginal but today it was worse because there was a large root wad from an old growth tree jammed in the bottom of the drop. There was the thinnest of lines between the root wad and the undercut cave in the left wall, but I decided not to chance it. Pete signaled from upstream that he was going to run it and I stood there sweating, clenching my puny throw rope in my hand while I watched the current tear through the root wad. Pete had to catch an eddy just above me to avoid the tree, and the move was very, very thin. He ran the lead in, plowed through the big hole, and then rounded the corner just above me. I got ready but there was no reason to- he twisted effortlessly into the eddy and plopped over the ledge on the right. Downstream were a couple of small drops but we continued down through Boulderdash, the large boulder garden at the top of the next run. We ran this drop and then took out at a side bridge. After we took out Tim mentioned that he had seen a waterfall up on the Hot Springs Fork many years ago. Intrigued, we drove up and parked at Pegleg Falls Park. Pegleg is a nice, ledgy fifteen footer and we decided to give it a go. While we were getting ready a drunken local who was fishing with his girlfriend at the pool below the falls warned us that there is a ledge about seven feet under the surface. We examined the falls again and were confident that the slightly less than vertical slide on the left side would keep us from hitting the ledge. I went first and had to wait upstream while the drunk guy waded across the river to jump in from the other side. I ran it no problem, followed by Tim while Pete took pictures. Pete didn't want to put his wet stuff back on, so he just threw on his PFD and helmet for his run! Pete's run over Pegleg, sans drytop. 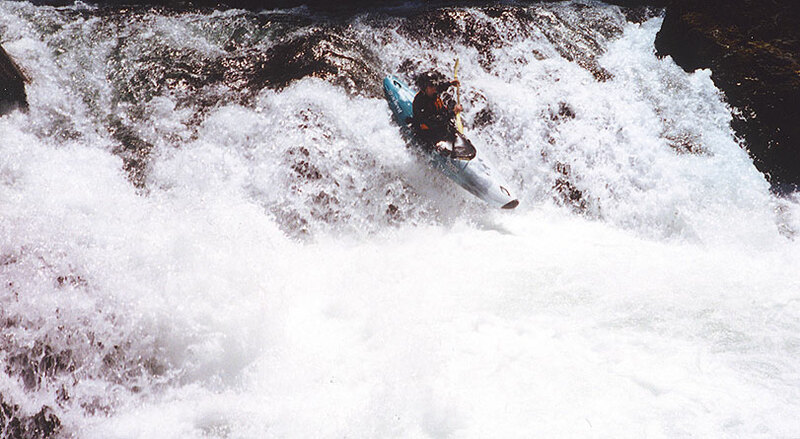 Access and Flows: See the Falcon Guide: Paddling Oregon by Robb Keller. We ran it in the spring at an estimated flow of 500 cfs; the Clackamas was running about 2500 cfs at the Three Lynx gauge. You could easily double the flow we ran it at and not have any additional problems.